Major advances in the field of pediatric oncology have resulted in improved survival rates for children and adolescents diagnosed with malignancies. From these successes, the field of survivorship has emerged with attention to the late effects of cancer therapy including infertility. Studies have shown that survivors of childhood cancers consider fertility preservation an important part of their treatment and long-term quality of life. The American Society of Clinical Oncology (ASCO) updated published guidelines in 2013 addressing fertility preservation at the time of a new cancer diagnosis as standard of care. For young males who have achieved puberty, obtaining sperm for cryopreservation through masturbation is the most common method. However, for adolescents, developmental concerns present additional challenges to obtaining sperm compared to their young adult counterparts. Alternatives for obtaining sperm exist for those for whom masturbation is not an option. For prepubertal males, only experimental methods exist. Studies have also shown that oncologists who treat children and adolescents are aware of the effects of cancer treatments on fertility but that barriers and difficulties exist that prevent adequate attention to this topic. 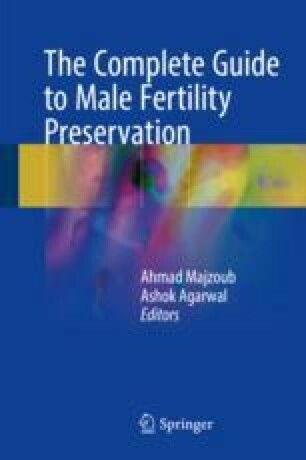 This chapter emphasizes the special considerations that exist in fertility preservation in adolescent males with a focus on sperm banking. Livestrong. Fertility preservation options for men. 2016. https://www.livestrong.org/we-can-help/fertility-services/fertility-preservation-options-men. Accessed 18 Oct 2016.